This process is very time consuming. It would be much better to use the time to model the principal buildings rather simple generic buildings that nobody notice. It is repetitive. I deeply hate to do same things twice. Low variance. At the end all the building started to look the same. 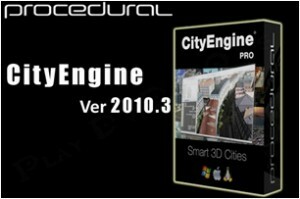 I did not have the solution to this problem till 2010, when a swiss company, Procedural (today ESRI), published a software for the ‘procedural’ generation of cities: CityEngine. At this point, if we call the above ‘Program’ by changing every time some parameter (#DoorOBJ, #RoofType, etc) we can generate a large variance of buildings with a single click.This is exactly what CityEngine does (with a much higher level of complexity, of course), it allows you to ‘describe’ the building process modeling with a pretty complex Grammar and then it can, more or less randomly, generate buildings using random sets of parameters at each iteration. With a reasonable basic collection of details (doors, windows, textures, roofs) the combinations of the resulting buildings are pretty infinite. The results of this process is a highly detailed collection of unique buildings that can be exported in Wavefront format and then loaded in the main modeling software (in my case, Lightwave). I am a software developer, it was not difficult at all for me to learn this Grammar and to develop the script for Ostia. 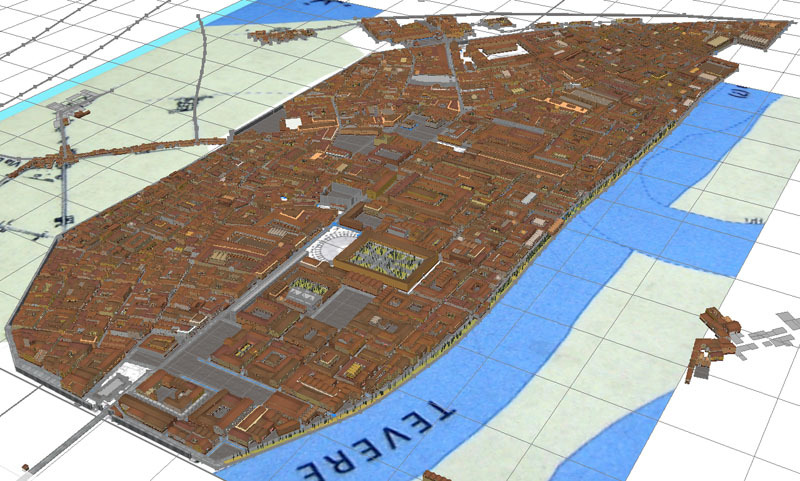 This task took me about 3 months (and from time to time I am still adding new features) but I can finally generate with one click all the secondary buildings of Ostia. 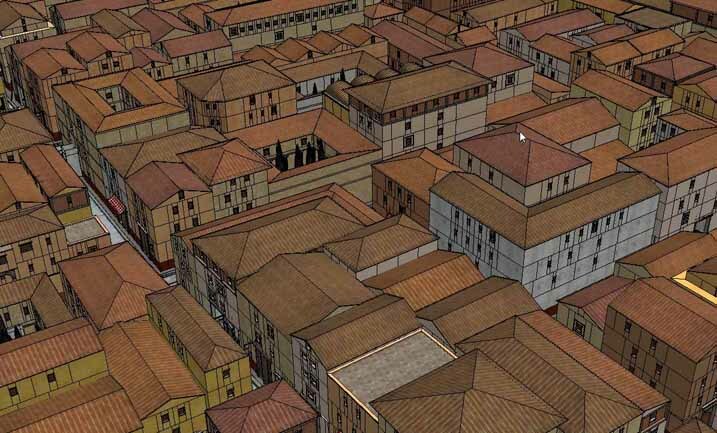 The last version of Ostia Antica with CityEngine takes 6 minutes to be completely rebuilt and it counts 20546 Objects for a total of 7`044`721 polygons. I was even able to model some of the principal monuments using only CityEngine, like the Hortensius Horrea, the Great Horrea and Horrea of Artemis. For other monuments, I have further customized in Lightwave the model created with CityEngine, like the Guilds Square, the Garden Houses and the Navalia. A detail of a block created with CityEngine.